On one of our favorite walks, the slightest breeze brings the sounds of a flowing mountain spring. But thirsty as we may be, we no longer bother looking for moving water. It’s actually the flutter of aspen leaves set trembling by air currents passing by. Depending upon the speed of the air, the sound can range from the almost inaudible hiss of soft rainfall (some call it the music from thousands of butterfly wings) to the rush of a mighty mountain stream. If there is any air movement at all there will be some sound, accompanied by a shimmering light show as the aspen leaves flutter in the breeze. Unlike the leaves of other trees, the aspen is designed for movement. The stem of each leaf is flat, and the leaf itself is attached to the stem at a ninety degree angle. No matter the direction, the slightest puff of air will strike a flat surface and start the leaves trembling. Even the tree’s scientific name, Populus tremuloides, points out this attribute. We love aspen groves in any season, but in the fall these trees set the western mountains aglow. Depending on the altitude, starting in late September and continuing through October aspen leaves change into their fall attire. Usually it’s a brilliant yellow, but sometimes instead of shades of gold a grove of aspen takes on a reddish glow. What surprises many is that an entire grove will usually make the same color changes at precisely the same time. To understand why, you need to look below the surface. An aspen grove isn’t just a collection of pretty trees; it’s actually a large underground root system connecting all the trees in a colony. Some say that the biggest aspen grove is actually the largest organism (by mass) in the world. The most famous example is found in Utah, and has the nickname Pando (Latin for “I spread”) for one of its methods of reproduction. Like some other plants, the aspen can reproduce in two ways. A single aspen tree can create as many as a million seeds; soft, fluffy, wind-transported masses that sometimes collect in what look like snow drifts. But it also uses vegetative reproduction, sending up shoots from an expanding root area. These shoots are what we view as aspen trees. Even with the millions of seeds produced, most aspens begin as sprouts from the massive root base. The aspen seed has a relatively short life-span, and unless it finds precisely the correct environment almost no seeds survive, particularly in the arid west. It’s amazing that the aspen is still the most widely distributed tree in North America. Because they sprout from the same root source, each aspen tree in a grove has identical genetic characteristics; the same angle of branching from the main stem, the same color of bark (usually white, but in some groves ranging from orange to green), the same shade of green leaves in the spring, and the same shade of foliage in autumn. Looking down from mountain roads you can identify different aspen groups by their color. Even in early spring there is a visible difference. One grove of aspens will appear green, having sprouted young leaves, while another grove nearby may show only white bark since the leaves have yet to appear. Come back a week later and both groves may be green, but perhaps of a different shade. In the fall, the colors will probably turn at a different time for each grove, and the colors themselves will vary. Even the leaves fall on their own schedule. Pando, one of the largest aspen groves, covers an area of 106 acres and has an estimated mass of over 6,000 tons. By actual count there are over 47,000 aspen stems growing from Pando, with an average age of 130 years (based on tree ring dating). The real question is the age of the entire organism. Most experts agree that it’s at least 10,000 years old, but some date its age to almost a million years. Aspen groves often mark the location of a previous disaster. The trees require lots of sunlight, so many aspens are found where the ground has been laid bare by an avalanche, a mudslide, or a fire. In fact, over a very long period of time the absence of fire can lead to the end of an aspen colony. Beneath an aspen canopy there exists an ideal environment for shade-loving plants. If trees that grow taller than the aspen take root, the colony will be replaced, leaving only the underground root system. Fortunately that root system can lay dormant for centuries, waiting for just the right conditions to send new sprouts upward. A massive fire provides just those conditions. After the fire, while other seed-bearing trees try to get their start, the aspen root sends up shoots that grow as much as three feet each season. This speedy growth allows them to race ahead of trees developing from seeds, and a “new” aspen grove is born. Even without a pre-existing rootstock, a burned area provides the ideal habitat for aspen seeds blown in on the wind. But it is really the root system that controls what happens in an aspen grove. Perhaps one area of the grove exists on drier soil. The roots can transfer moisture from another part of the grove. The same thing can happen if one section of the colony needs nutrients that only exist in another area. With this much co-ordination of effort, maybe it’s not such a surprise that aspens thrive in so many places. This co-ordination actually occurs in both directions. As an aspen grove develops, the individual trees send hormones back into the root system to suppress the production of new stems so there will be less competition within the colony. But if part of the colony dies, from fire or from any other disaster, the hormone flow stops and the root system immediately begins sending more aspen shoots to the surface. Since we spend much of our time in the west, we depend on the aspen for the brightest of our fall colors. The timing of the peak in aspen colors, just like the changes in other fall foliage, varies with the temperature and moisture conditions of a particular year. 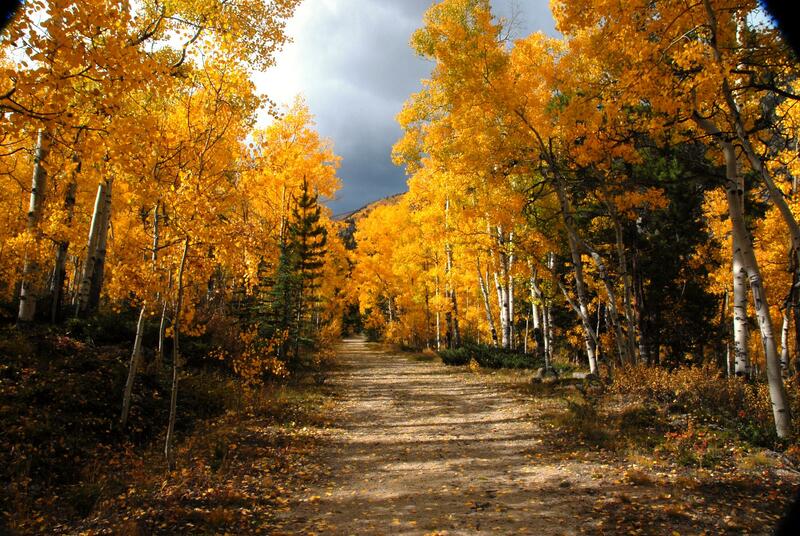 To catch the best of the aspen fall colors, do as we do. Check with your nearest Forest Service office. Sometimes they have an Annual Fall Foliage Hotline.